Where is Domino "required" to complete Chapter 4? I was hoping to save CP for the Venom release and would prefer not to blow it on Domino. well, i've tried Hulk's (level 12 original) battle twice and failed. positive i'm doing something wrong.. given after 1 attack I get a choice between banner or hulk banner seems to be the better option as I live longer. cant get past sif vs enchantress heroic battle. any tips? 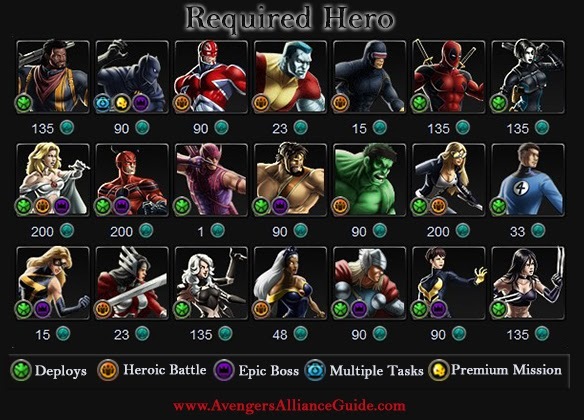 @jakecobb Ok, first equip one Aug Iso-8, (one that gets higher crits) on Hulk's lvl 2 ability; and try to boost Hulk's attack, health and defense. Now the battle, use the Hulk's sonic attack (lvl 6) to remove Abbomination's shield, then choose Hulk Smash and on your next turn use the lvl 2 ability, it will leave Abbomination quite low on health if not dead. And repeat. If you got Sif's scrapper suit that gives her guaranteed crits Boost Sif's health (to survive the DOT effects) and attack. If you got original Sif you also want to boost her accuracy. Now, use the Augmented iso that increases damage on her lvl 1 ability (that's the one she uses on follow up attacks. The battle, if you go first is easier use her quick action then her level 2 (will prompt a follow up) then Enchantress turn, she DOTs you and asks for an action, choose RAGE. On your second turn you will be winded, so no follow up on your attack. Then Enchantress again prompts two options, choose RAGE again, then on your third turn lvl 2 and the follow should kill her. Same thing if Enchantress goes first, just you'll need more health to survive one more turn. ok,so i'm stuck at "Use Valkyrie's "Geirr" 5 Times" , i've done it like a dozen times, but the counter is stuck on 1/5 :( what's wrong? Sif, Captain Britain and Mockingbird seems impossible to win. Sif doesn't inflicts damage; Britain loses without fighing, and Mockingbird... Before she can hit Zemo, the hydras beat her. Is the CP Iso the only way? how to defeat savin with over 45000 it is impossible! how to defeat venom with 45000 ??? it says in the task list here that in mission 12b, crowbar pleaser, you have to beat Wrecker with 20K points, but in game it's 98k and I can't seem to get more than 75k, even defeating quickly, using chrono boosts and getting epic overkills. any help? Well think this game has run it's course!! !time to move on to something else!!!!! @HCASC NCT Domino is needed for Mission 5.